A new independent economic impact study on USC shows that the university is one of California’s strongest economic engines. 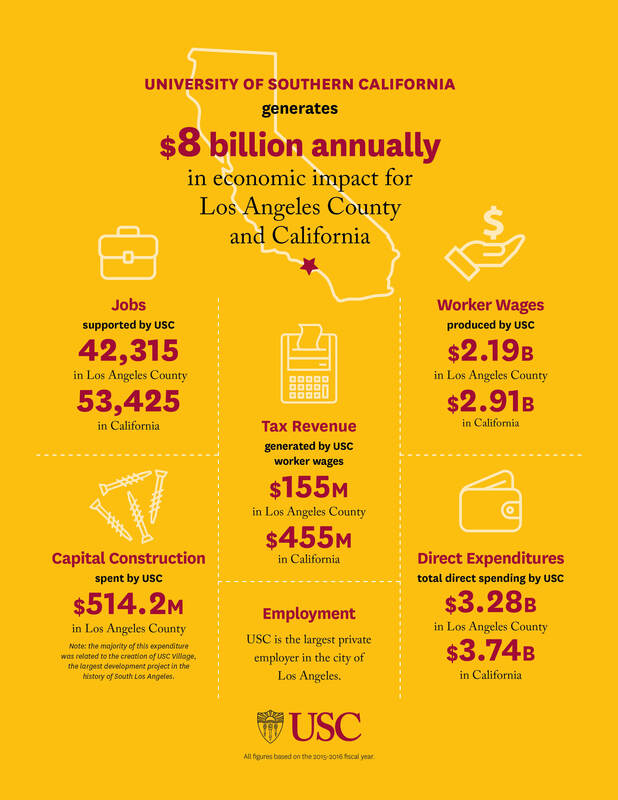 The study found that USC spurs $8 billion annually in economic activity in the Los Angeles region and California. The snapshot indicates the university will contribute well more than $80 billion to the economy over the next decade. $37.9 million for the local economy through visitors attending events at USC, such as football games at the L.A. Memorial Coliseum, the Los Angeles Times Festival of Books and USC Commencement. The University of Southern California also attracted $697 million in sponsored research to fund studies in biotech, public health, biomedical engineering, cancer and Alzheimer’s disease, among others. Download the complete report (PDF file).